This pic was taken On Queen St W early on a Sunday before the traffic got heavy and before any stores opened. 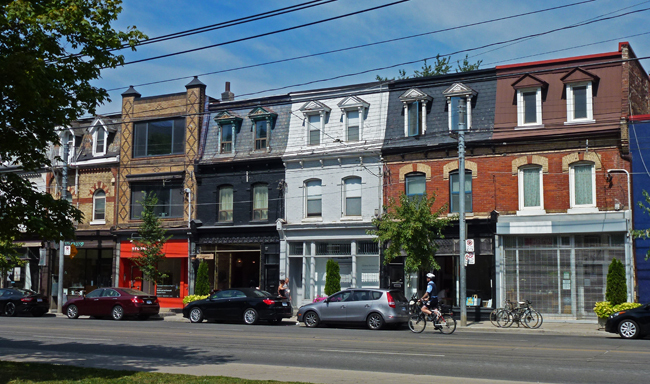 This is such a nicely maintained block of commercial buildings each different although most are the same style. The four on the right individualised the facades with slightly different cosmetic touches...nice! Looks like it is nice and calm and quiet. Hope that you are having a great Sunday! ... a great row, I love the Second Empire style! Hello, always great to see the nice maintain buildings. Enjoy your and new week ahead! The four on the right look like they were all one building at one time. It certainly is a nice looking row of buildings. Looks fab Pat, I see the early morning bike riders are already up and about! A beautiful row of buildings each with their own slightly different style. I love old storefronts on Queen Street. Things are changing in the west end. I like a quiet morning, myself! I like the same but different, it's a nice looking block. Agreed. A very pleasant commercial urban streetscape. You show the beauty of Toronto! A perfect way to begin the day!